Hybridity done in a certain fashion—immersed in telling while methodically subverting format, structure, intention—is a careful job. It is a one-person string quartet playing parts that must carry a different resonance, and yet harmonize. Memoir and analysis have blended artfully in recent collections like Appetites by Caroline Knapp and The Empathy Exams by Leslie Jamison. This has often felt exciting, rich, and appropriate: orientation and honesty, analysis and personal reflection married well. 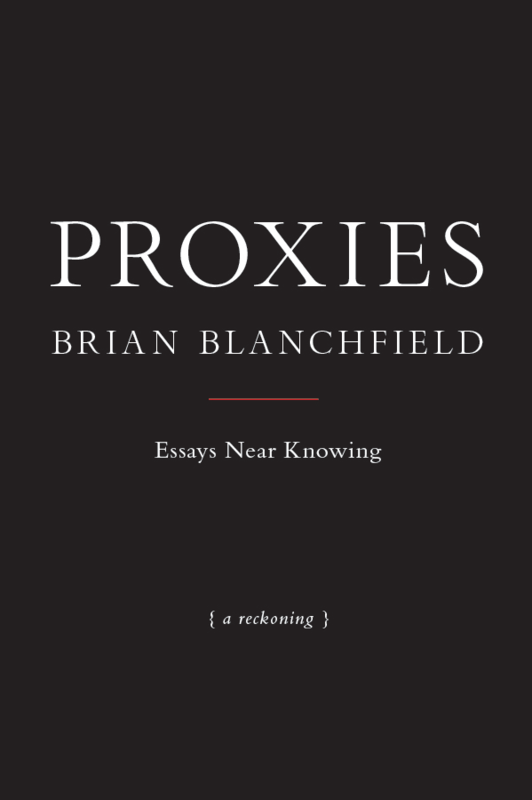 Joining the fold is Brian Blanchfield’s Proxies: Essays Near Knowing (Nightboat, 2016), winner of the 2016 Whiting Award in Nonfiction. Blanchfield’s North Carolinian laconic wit, pop-culture dissection, literary erudition, wry and transfixed storytelling, serve up an entertaining and edifying essay collection. How does Blanchfield, or any hybrid memoirist, pull out the quick and subtle threads that are most taut and most tender? It is no easy feat, but this author makes it look easy. 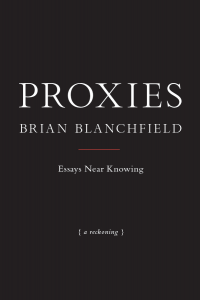 With two books of poetry under his belt, Blanchfield crafts sentences significantly elevated by their narrative musicality and gymnastic precision. The narrative voice, even when erudite, always invites, warms, and revels conversationally. It engages and charms the reader in such a way that I can only imagine was shaped by his North Carolina upbringing. In fact, Blanchfield’s Southern childhood is an apt subject of contradiction and complexity for the book. In “On the Understory” he explores through the Dukes of Hazzard and other stories that summed up the virtue of “good ole boys” and the Confederate flag, now sources of some complex shame. He does, in essence, a “reading” of his childhood and its enigmas. But these essays “near knowing” are not searching exclusively for epiphany, or even discovery. From his sense of otherness on various levels, as well as orientation in space (experienced through geographic location, career roles, or desire, as deliciously and deliriously explored in “On Man Roulette”), Blanchfield’s “repeatable experiment” is to wind his own his knowing (vast, personal, other, limited) around a single subject (used as metaphysical symbol, metaphor, focus of meditation), free of the encumbrances of other voices. Any corrections are saved for later in the aptly titled section in the back of the book. This “Corrections” section, I believe, serves as a kind of release valve for the rest of the book: breathing room for the essayist. The verb “essay” originated from the Old French “essayer,” which came from the Late Latin “exigere” (to weigh or ascertain). In more recent centuries it has taken on the meaning in French and English “to try.” I like to think Brian Blachfield, author of 24 single-subject essays in sat down to write with both the sense of “weighing” and “trying” simultaneously. The noun “essay” is rooted in the verb in Michel de Montaigne’s three volume Essais from the mid-1500s, widely regarded as the predecessor of the modern essay. Montaigne has said his goal was to describe man, and especially himself, with utter frankness and honesty (“bonne foi“). However essays existed in Japan several centuries before that, known as zuihitsu, “loosely connected personal essays and fragmented ideas that typically respond to the author’s surroundings.” The French have a lovely term for this: “sens de l’orientation” (an awareness of your orientation in space).” Sens de l’orientation and bonne foi. Orientation and honesty. Proxies’ narrative goal therefore is not necessarily understanding, I think, as much as knowing. Blanchfield wants to know how his Self works: its history, its perceptions, its knowledge and its limits, metaphysical and otherwise. Of course he would probably like to understand, the way we all try to make understandable meaning of our experiences. But Blanchfield does not prioritize this “therefore” in his poetry or essays. And what we get is a record of Blanchfield’s mind navigating without fear of “being wrong.” This is a very beautiful and valuable thing. Proxies concluding chapter “Corrections” true to its name, corrects or further explains the prior essays. This final subversion of the ‘accuracy’ inherent in essay is not subversive in the way one might think. This is not a book that includes the codes to its own destruction, or self-subverts by questioning its own assumptions all that much. The “Corrections” essay is really more like editor’s notes. Footnotes. Addendum. Factoids. The concept though is interesting, it is how these are essays that do not seek to understand experience as much as to revel in it. Nina Alvarez’s poems, short stories, and hybrid nonfiction have appeared in various journals including Split Lip, Prick of the Spindle, The Sonder Review, Electric Velocipede, and Grasslimb. Her play “The Life of Leo Wool,” was produced in 2013, and she won GeVa’s 2 Pages/2 Voices short play contest in 2015. She runs Cosmopgraphia Books, a small press in Rochester, NY, as well as the author services company Dream Your Book. Nina is an award-winning poet and teaching artist and holds an MA in English with a focus on literary theory from the University of Albany.